In a series where the Empire or the dark side is usually each episode's big threat, it was nice to see an episode in which the threat was simpler and more primal. It was smart to use spiders for this threat, because their appearance and the rebels' reactions to them played on real-world fear and anxiety about spiders. (I thought I was going to have nightmares after watching this episode.) The creatures' movements were perfect—slow, steady, and uber-creepy—and their glittering eyes, chittering steps, and inhuman shrieks made them feel authentically scary. I particularly liked the way the spider that had been holding Rex dropped out of its hole in the ceiling; it was really unsettling. I also enjoyed the fact that Ezra couldn't connect with the spider, and the fact that this surprised him. As executive producer Dave Filoni observed in Rebels Recon, Ezra was used to bonding with more familiar creatures, and the spider, out on the edge of the known galaxy, was so foreign to him that he couldn't make the connection. The spider confrontation sewn throughout "The Mystery of Chopper Base" seemed almost like filler A-plot to space out the scenes of the B-plot: Kanan and Ezra preparing to depart, and the other rebels' reactions to their imminent departure. That was fine, by the way; we've had so many fast-paced episodes recently that it was nice to slow things down a bit and give the subtext room to rise to the surface. And man, was there a lot of subtext to boil up. As the episode began, Kanan and Ezra were in the middle of an intense, prolonged bout of training, and even through my TV screen, the air on the Ghost seemed heavy with trepidation and anticipation about what they were about to do: leave with Ahsoka to confront an Inquisitor and venture to the dreaded planet Malachor. With the stakes so high, it made sense that Kanan would press Ezra harder than he'd ever pressed him. It was crunch time—the culmination, in some ways, of all of their hard work—and Kanan knew that there was no room for error. He wanted Ezra to be ready. He needed him to be ready. Ezra didn't seem to grasp the stakes. When the ended their last round in mutually assured death, Ezra called it a tie, and Kanan sharply rebuked him: "There's no such thing as a tie. You lose, you die." It was clear that he wanted to drive home the urgency of their mission to Ezra, but this seemed to catch his apprentice off guard more than anything else. Ezra erred again by saying that killing an Inquisitor would be a win, to which Kanan—perhaps fearing that a focus on killing would lead Ezra to the dark side—responded, "You win by surviving." Recall that Kanan recently encountered a Force vision warning him about Ezra's growing power and potential for darkness. Even errant comments like Ezra's remark about killing an Inquisitor must set Kanan's teeth on edge. It occurred to me, rewatching this episode, that Kanan had to walk a fine line in preparing Ezra for their mission with Ahsoka. He had to drill Ezra until the younger man's combat instincts were up to par—like when he lunged at Ezra when he turned his back, to remind him not to get overconfident—but on the other hand, he had to urge Ezra to calm his mind and focus on the right goals. In the old days, when the Jedi were at the height of their power, there was an entire temple on Coruscant full of people who could coach padawans through the balancing act of being a warrior-monk. Now, there was just Kanan, struggling to instill the right lessons without tipping the vulnerable young man too far in one direction. Watching all of this from the overhead railing on the Ghost, Hera conveyed a mixture of sadness and resignation. She knew that she might lose them on this mission, and that scared her. She was used to being in charge, having the intel, and setting her sights on a concrete end-game. This Jedi stuff didn't sit well with her because there were too many inscrutable variables and unknown unknowns. Hera was also losing two valued team members, and that worried her, as the team's leader, for both logistical and interpersonal reasons. "We've got to get used to not having them around," Hera told Zeb when the Jedi split from the rest of the group to locate Rex in the spiders' den. I really liked this moment, because it showed Hera, ever the tactician, already preparing the team for the Jedi's absence. She clearly didn't like it, but she had to put that aside, step up, and be the leader she'd always been. But one team member was more than just a team member. When Kanan observed that the rebels' new base had "everything you need," she replied, with no small degree of anguish, "Except you and Ezra." It has been obvious for a while to every adult Rebels fan—and probably some younger audience members too—that Kanan and Hera, for the sake of the rebellion, are suppressing their feelings for each other. 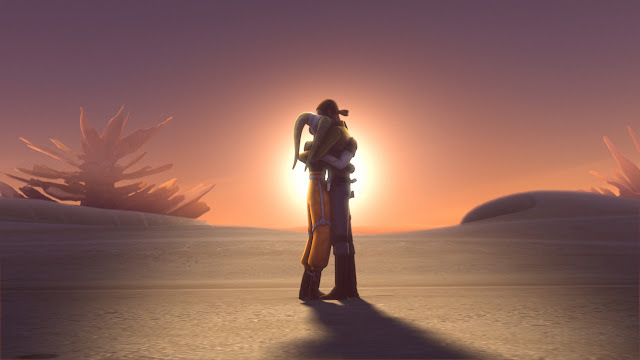 In most episodes, that's in the background, seen in the way Hera calls Kanan affection names or the way they hug after an episode-long separation. In this episode, though, the stakes were higher. The air was taut with things unsaid, possibly forever. Hera didn't want Kanan to go, but she also knew that she couldn't stop him—and that, as he pointed out, his mission was critically important to the broader rebellion. Hera might have seen the situation for what it was, but Kanan didn't fully grasp how much his and Ezra's impending departure was affecting Hera. Sabine had to spell it out for him: Hera was rattled. When Kanan tried to soothe Hera with his trademark cockiness, she countered, "You realize I know when you're lying, right?" This wasn't just a flippant rejoinder. It was a reminder that Hera and Kanan have worked together for so long that she recognizes signs in him that others miss. "Whatever you're facing," Hera said, "I wanted us to face it together." She prioritized teamwork and for that reason worried about the Jedi's departure, but Kanan looked at the mission on a mystical, "this is our path alone" level. This wasn't something that Hera and the others could help them with, even if he'd wanted to bring them. Hera and Kanan's closing hug wasn't just perfect fodder for the shippers; it also captured their differing personalities: Kanan's confidence and need to reassure juxtaposed with Hera's wariness and insatiable habit of imagining outcomes, Kanan's restlessness—particularly where the Force was concerned—juxtaposed with Hera's thoughtfulness. Maybe Kanan didn't actually feel as confident as he seemed, but even if that were the case, it only further emphasized that he felt the need to play that role for Hera. I loved this final scene between the two of them because of how starkly it drew out their essential character traits. With the season finale just around the corner, "The Mystery of Chopper Base" took some time to emphasize how much our heroes have progressed over the last two years. This began with Kanan, who told Hera that he now understood the need for them to be part of a larger movement. When you recall Kanan's adamant opposition to joining Sato's fleet in the season premiere, this admission seems remarkable. It represents significant progress for him as a person. Working with Sato's fleet has taught him the value of organizational support. Then there was Zeb and Ezra watching the sunset together. This was another remarkable departure from the past. Zeb didn't even want Ezra on the team at first, and the two sparred incessantly for several episodes before settling into a big brother/little brother routine of light-hearted pranks with an edge of antagonism. But Zeb has grown to respect Ezra over the last two seasons' worth of missions. Not only does he appreciate Ezra's presence on a personal level, but by virtue of trusting Ezra, he acknowledges that he's a moderately proficient Force-user. Again, recall the early episodes: Zeb mocked the very idea of Ezra mastering any Force abilities during his initial training sessions with Kanan. Zeb's line "We can swap war stories" is a profound comment on their kinship. It's something a Lasat honor guardsman would say to a comrade, not to a pipsqueak. "The Mystery of Chopper Base" presented a scary but relatively simple challenge for the rebels, but now Ezra and Kanan were about to take on a much bigger, much more dangerous task. As Ezra sat watching the spiders walk around the edge of the base, he seemed like a kid relishing his last few hours of free time before the school year began. When Ahsoka appeared, the episode subtly emphasized that Ezra was about to embark on a fateful mission: as he told her that he couldn't connect with the spiders, they abruptly turned away from the base and departed, as if to mark the end of this whole encounter. At that same moment—and perhaps for the same reason—we heard a light portion of Vader's Theme in the background, presaging a marquee faceoff. In the episode's final moments, as the camera panned up to an eerily calm bird, the music darkened to the more recognizable theme to kick us into the season 2 finale.